Georg Friedrich List (6 August 1789 – 30 November 1846) was a German economist with dual American citizenship who developed the "National System", also known as the National System of Innovation. He was a forefather of the German historical school of economics, and argued for the German Customs Union from a Nationalist standpoint. He advocated imposing tariffs on imported goods while supporting free trade of domestic goods, and stated the cost of a tariff should be seen as an investment in a nation's future productivity. List was a liberal who promoted representative democracy and civil liberties and contributed to the Staatslexikon of Karl von Rotteck and Carl Theodor Welcker. Emmanuel Todd considers the work of John Maynard Keynes to be the logical continuation of List's theories. List was born in Reutlingen, Württemberg. Unwilling to follow the occupation of his father, who was a prosperous tanner, he became an accountant in the public service (a so-called 'Cameralist of the Bureaus'), and by 1816 had risen to the post of ministerial under-secretary. In 1817, he was appointed professor of administration and politics at the University of Tübingen, but the fall of the ministry in 1819 compelled him to resign. As a deputy to the Württemberg chamber, he was active in advocating administrative reforms. He was eventually expelled from the chamber and in April 1822 sentenced to ten months' imprisonment with hard labor in the fortress of Asperg. He escaped to Alsace, and after visiting France and England returned in 1824 to finish his sentence, and was released on undertaking to emigrate to America. Arriving in the United States in 1825, he settled in Pennsylvania, where he became an extensive landholder. He first engaged in farming, but soon switched to journalism and edited a German paper in Reading. He was active in the establishment of railroads. Some argue (e.g. Chang, 2002) that it was in America that he gathered from a study of Alexander Hamilton's work the inspiration which made him an economist of his pronounced "National System" views which found realization in Henry Clay's American System. Others deny this (Daastøl, 2011), since he argued for a German customs union already in 1819, when he established the first German union for industry and trade. In 1827 he published a pamphlet entitled Outlines of American Political Economy, in which he defended the doctrine of pragmatic protection and free trade. The discovery of coal on some land which he had acquired made him financially independent. In 1830, he was appointed United States consul at Hamburg, but on his arrival in Europe he found that the Senate had failed to confirm his appointment. After residing for some time in Paris, he returned to Pennsylvania. He next settled in Leipzig in 1833, where for some time he was U.S. consul. He was a journalist in Paris from 1837 to 1843. He wrote several letters for the Augsburg Allgemeine Zeitung, which were published in 1841 in a volume under the title of Das nationale System der politischen Oekonomie. In 1843 he established the Zollvereinsblatt in Augsburg, a newspaper in which he advocated the enlargement of the customs union (German: Zollverein), and the organization of a national commercial system. He strongly advocated the extension of the railway system in Germany. The development of the Zollverein to where it unified Germany economically was due largely to his enthusiasm and ardour. 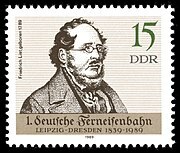 In 1841, his ill health had led him to decline an offer to edit the Rheinische Zeitung, a new Cologne paper of liberal views, and Karl Marx took the post. He visited Austria and Hungary in 1844. In 1846, he visited England with a view to forming a commercial alliance between that country and Germany, but was unsuccessful. His latter days were darkened by many misfortunes; he lost much of his American property in a financial crisis, ill-health also overtook him, and he killed himself on 30 November 1846. His idea of productive powers was influenced by the philosophy of productivitiy of Friedrich Wilhelm Joseph Schelling. He was acquainted with Robert Schumann and Heinrich Heine. List's theory of "national economics" differed from the doctrines of "individual economics" and "cosmopolitan economics" by Adam Smith and J.B. Say. List contrasted the economic behaviour of an individual with that of a nation. An individual promotes only his own personal interests but a state fosters the welfare of all its citizens. An individual may prosper from activities which harm the interests of a nation. "Slavery may be a public calamity for a country, nevertheless some people may do very well in carrying on the slave trade and in holding slaves." Likewise, activities beneficial to society may injure the interests of certain individuals. "Canals and railroads may do great good to a nation, but all waggoners will complain of this improvement. Every new invention has some inconvenience for a number of individuals, and is nevertheless a public blessing". List argued that although some government action was essential to stimulate the economy, an overzealous government might do more harm than good. "It is bad policy to regulate everything and to promote everything by employing social powers, where things may better regulate themselves and can be better promoted by private exertions; but it is no less bad policy to let those things alone which can only be promoted by interfering social power." Due to the "universal union" that nations have with their populace, List stated that "from this political union originates their commercial union, and it is in consequence of the perpetual peace thus maintained that commercial union has become so beneficial to them. ... The result of a general free trade would not be a universal republic, but, on the contrary, a universal subjection of the less advanced nations to the predominant manufacturing, commercial and naval power, is a conclusion for which the reasons are very strong. ... A universal republic ... , i.e. a union of the nations of the earth whereby they recognise the same conditions of right among themselves and renounce self-redress, can only be realised if a large number of nationalities attain to as nearly the same degree as possible of industry and civilisation, political cultivation and power. Only with the gradual formation of this union can free trade be developed; only as a result of this union can it confer on all nations the same great advantages which are now experienced by those provinces and states which are politically united. The system of protection, inasmuch as it forms the only means of placing those nations which are far behind in civilisation on equal terms with the one predominating nation, appears to be the most efficient means of furthering the final union of nations, and hence also of promoting true freedom of trade." In his seventh letter List repeated his assertion that economists should realise that since the human race is divided into independent states, "a nation would act unwisely to endeavour to promote the welfare of the whole human race at the expense of its particular strength, welfare, and independence. It is a dictate of the law of self-preservation to make its particular advancement in power and strength the first principles of its policy". A country should not count the cost of defending the overseas trade of its merchants. And "the manufacturing and agricultural interest must be promoted and protected even by sacrifices of the majority of the individuals, if it can be proved that the nation would never acquire the necessary perfection ... without such protective measures." List argued that statesmen had two responsibilities: "one to contemporary society and one to future generations". Normally, most of leaders' attention is occupied by urgent matters, leaving little time to consider future problems. But when a country had reached a turning point in its development, its leaders were morally obliged to deal with issues that would affect the next generation. "On the threshold of a new phase in the development of their country, statesmen should be prepared to take the long view, despite the need to deal also with matters of immediate urgency." However, List claimed that only countries in temperate regions were adapted to grow higher forms of industry. On the other hand, tropical regions had a natural monopoly in the production of certain raw materials. Thus, there were a spontaneous division of labor and a confederation of powers between both groups of countries. List contended that Smith's economic system is not an industrial system but a mercantile system, and he called it "the exchange-value system". Contrary to Smith, he argued that the immediate private interest of individuals would not lead to the highest good of society. The nation stood between the individual and humanity, and was defined by its language, manners, historical development, culture and constitution. The unity must be the first condition of the security, well-being, progress and civilization of the individual. Private economic interests, like all others, must be subordinated to the maintenance, completion and strengthening of the nation. The progress of the nation through these stages is the task of the state, which must create the required conditions for the progress by using legislation and administrative action. This view leads to List's scheme of industrial politics. Every nation should begin with free trade, stimulating and improving its agriculture by trade with richer and more cultivated nations, importing foreign manufactures and exporting raw products. When it is economically so far advanced that it can manufacture for itself, then protection should be used to allow the home industries to develop, and save them from being overpowered by the competition of stronger foreign industries in the home market. When the national industries have grown strong enough that this competition is not a threat, then the highest stage of progress has been reached; free trade should again become the rule, and the nation be thus thoroughly incorporated with the universal industrial union. What a nation loses in exchange during the protective period, it more than gains in the long run in productive power. The temporary expenditure is analogous to the cost of the industrial education of the individual. In a thousand cases the power of the State is compelled to impose restrictions on private industry. It prevents the ship owner from taking on board slaves on the west coast of Africa, and taking them over to America. It imposes regulations as to the building of steamers and the rules of navigation at sea, in order that passengers and sailors may not be sacrificed to the avarice and caprice of the captains. [...] Everywhere does the State consider it to be its duty to guard the public against danger and loss, as in the sale of the necessaries of life, so also in the sale of medicines, etc. While List once had urged Germany to join other 'manufacturing nations of the second rank' to check Britain's 'insular supremacy', by 1841 he considered that the United States and Russia would become the most powerful countries—a view also expressed by Alexis de Tocqueville the previous year. List hoped to persuade political leaders in England to co-operate with Germany to ward off this danger. His proposal was perhaps not so far-fetched as might appear at first sight. In 1844, the writer of an article in a leading review had declared that 'in every point of view, whether politically or commercially, we can have no better alliance than that of the German nation, spreading as it does, its 42 millions of souls without interruption over the surface of central Europe'. The practical conclusion which List drew for Germany was that it needed for its economic progress an extended and conveniently bounded territory reaching to the seacoast both on north and south, and a vigorous expansion of manufacture and trade, and that the way to the latter lay through judicious protective legislation with a customs union comprising all German lands, and a German marine with a Navigation Act. The national German spirit, striving after independence and power through union, and the national industry, awaking from its lethargy and eager to recover lost ground, were favorable to the success of List's book, and it produced a great sensation. He ably represented the tendencies and demands of his time in his own country; his work had the effect of fixing the attention, not merely of the speculative and official classes, but of practical men generally, on questions of political economy; and his ideas were undoubtedly the economic foundation of modern Germany as applied by the practical genius of Bismarck. I perceived that the popular theory took no account of nations, but simply of the entire human race on the one hand, or of the single individual on the other. I saw clearly that free competition between two nations which are highly civilised can only be mutually beneficial in case both of them are in a nearly equal position of industrial development, and that any nation which owing to misfortunes is behind others in industry, commerce, and navigation ... must first of all strengthen her own individual powers, in order to fit herself to enter into free competition with more advanced nations. In a word, I perceived the distinction between cosmopolitical and political economy. Had the English left everything to itself—'Laissez faire, laissez aller', as the popular economical school recommends—the [German] merchants of the Steelyard would be still carrying on their trade in London, the Belgians would be still manufacturing cloth for the English, England would have still continued to be the sheep-farm of the Hansards, just as Portugal became the vineyard of England, and has remained so till our days, owing to the stratagem of a cunning diplomatist. Indeed, it is more than probable that without her [highly protectionist] commercial policy England would never have attained to such a large measure of municipal and individual freedom as she now possesses, for such freedom is the daughter of industry and wealth. It is a means of national defence: it facilitates the concentration, distribution and direction of the army. It is a means to the improvement of the culture of the nation ... It brings talent, knowledge and skill of every kind readily to market. It secures the community against dearth and famine, and against excessive fluctuation in the prices of the necessaries of life. It promotes the spirit of the nation, as it has a tendency to destroy the Philistine spirit arising from isolation and provincial prejudice and vanity. It binds nations by ligaments, and promotes an interchange of food and of commodities, thus making it feel to be a unit. The iron rails become a nerve system, which, on the one hand, strengthens public opinion, and, on the other hand, strengthens the power of the state for police and governmental purposes. 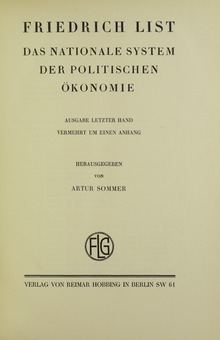 List's principal work is entitled Das Nationale System der Politischen Ökonomie (1841) and was translated into English as The National System of Political Economy. Before 1914, List and Marx were the two best-known German economists and theorists of development, although Marx can hardly be classified as a development economist since he (unlike List) devised no policies to promote development and instead stuck to policies that primarily promoted revolution. This book has been more frequently translated than the works of any other German economist, except Karl Marx. He is credited with influencing National Socialism in Germany, and his ideas are credited as forming the basis of the European Economic Community. In Ireland he influenced Arthur Griffith of Sinn Féin and these theories were used by the Fianna Fáil government in the 1930s to instigate protectionism with a view to developing Irish industry. Among others he strongly influenced was Sergei Witte, the Imperial Russian Minister of Finance, 1892-1903. Witte's plan for rapid industrialisation was centred around railroad construction (the Trans-Siberian railroad for example) and a policy of protectionism. At the time, it was largely considered that Russia was a backward country with an under developed economy. The boom which was seen during the 1890s was largely credited to Witte's policy. As Marx was not interested in the survival of the capitalist system, he was not really concerned with economic policy, except in so far as the labour movement was involved. There, his argument was concentrated on measures to limit the length of the working day, and to strengthen trade union bargaining power. His analysis was also largely confined to the situation in the leading capitalist country of his day—the UK—and he did not consider the policy problems of other Western countries in catching up with the lead country (as Friedrich List did). In so far as Marx was concerned with other countries, it was mainly with poor countries which were victims of Western imperialism in the merchant capitalist era. Heterodox economists, such as Ha-Joon Chang and Erik Reinert, refer to List often explicitly when writing about suitable economic policies for developing countries. List's influence among developing nations has been considerable. Japan has followed his model. The international economic policy of Meiji Japan was a combination of Hideyoshi's mercantilism and Friedrich List's Nationale System der politischen Ökonomie. It has also been argued that Deng Xiaoping's post-Mao policies were inspired by List, as well as recent policies in India. China, under Deng, took on the clear features of a 'developmental dictatorship under single-party auspices.' The PRC would then belong to a class of regimes familiar to the 20th century that have their ideological sources in classical Marxism, but better reflect the developmental, nationalist views of Friedrich List. A 1943 German film The Endless Road portrayed List's life and achievements. He was played by Eugen Klöpfer. Wikimedia Commons has media related to Friedrich List. ^ a b c Chang, Ha-Joon. "Kicking Away the Ladder: How the Economic and Intellectual Histories of Capitalism Have Been Re-Written to Justify Neo-Liberal Capitalism". Post-Autistic Economics Review. 4 September 2002: Issue 15, Article 3. Retrieved on 8 October 2008. ^ Fonseca Gl. Friedrich List, 1789–1846 Archived 2009-01-04 at the Wayback Machine. New School. ^ a b "Strategies of Economic Order". Keith Tribe. Cambridge University Press. 2007. p. 36. Accessed January 27, 2010. ^ Wendler, Eugen (2014). 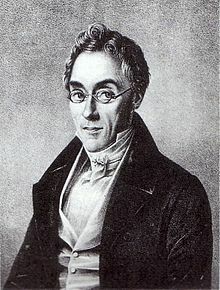 Friedrich List (1789-1846): A Visionary Economist with Social Responsibility. Springer. pp. 12 and 135–137. ^ Wendler, Eugen (2014). 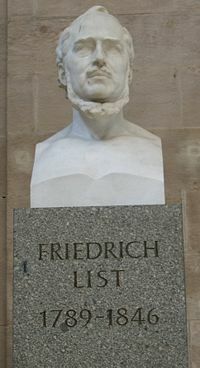 Friedrich List (1789-1846): A Visionary Economist with Social Responsibility. Springer. p. 220. ^ a b c d Wilson, J. G.; Fiske, J., eds. (1892). "List, Friedrich" . Appletons' Cyclopædia of American Biography. New York: D. Appleton. ^ a b c d e Gilman, D. C.; Peck, H. T.; Colby, F. M., eds. (1905). "List, Friedrich" . New International Encyclopedia (1st ed.). New York: Dodd, Mead. ^ Henderson, William O. Friedrich List: Economist and Visionary. Frank Cass: London, 1983, p. 85. ^ "Friedrich List". Encyclopædia Britannica. Retrieved 13 June 2009. ^ The National System of Political Economy, by Friedrich List, 1841, translated by Sampson S. Lloyd M.P., 1885 edition, Fourth Book, "The Politics", Chapter 33. ^ Marie-Luise Heuser: Romantik und Gesellschaft. Die ökonomische Theorie der produktiven Kräfte, in: Myriam Gerhard (Hrsg. ), Oldenburger Jahrbuch für Philosophie 2007, Oldenburg 2008, S. 253-277, ISBN 978-3-8142-2101-4, S. 253–277. Marie-Luise Heuser: Die Produktivität der Natur. Schellings Naturphilosophie und das neue Paradigma der Selbstorganisation in den Naturwissenschaften, Berlin (Duncker & Humblot) 1986. ISBN 3-428-06079-2. ^ Marie-Luise Heuser: Romantik und Gesellschaft. Die ökonomische Theorie der produktiven Kräfte, in: Myriam Gerhard (Hrsg. ), Oldenburger Jahrbuch für Philosophie 2007, Oldenburg 2008, S. 253-277, ISBN 978-3-8142-2101-4, S. 253–277. ^ Friedrich List. National System of Political Economy. p. 166. ^ The German Zollverein in the Edinburgh Review, 1844, Vol. LXXIX, pp. 105 et seq. ^ The National System of Political Economy, by Friedrich List, 1841, translated by Sampson S. Lloyd M.P., 1885 edition, Author's Preface, Page xxvi. ^ a b "Makes of nineteenth century culture: 1800–1914". Justin Wintle. Routledge. p. 367. Accessed January 27, 2010. ^ Dynamic forces in Capitalist Development: A Long-Run Comparative View, by Angus Maddison. Oxford University Press, 1991, page 19. ^ List's influence on Japanese economic policy: see "A contrary view: How the World Works Archived 2006-01-17 at the Wayback Machine, by James Fallows"
^ Frederick Clairmonte, "Friedrich List and the historical concept of balanced growth", Indian Economic Review, Vol. 4, No. 3 (February 1959), pp. 24-44. ^ Mauro Boianovsky, "Friedrich List and the economic fate of tropical countries", Universidade de Brasilia, June 2011, p. 2. ^ A. James Gregor, Précis No. 16, PS 137b - "Revolutionary Movements: Marxism and Fascism in East Asia" (Course Notes), 29 March 2005. Archived link, accessed 10 August 2014. This article incorporates text from a publication now in the public domain: Chisholm, Hugh, ed. (1911). "List, Friedrich" . Encyclopædia Britannica (11th ed.). Cambridge University Press. Goldschmidt, Friedrich (1878). Friedrich List, Deutschlands grosser Volkswirth [Friedrich List, Germany's greater national economy] (in German). Berlin: J. Springer. Retrieved October 22, 2014. Jentsch, Carl (1901). Friedrich List (in German). Berlin: Ernst Hofmann and Co. Retrieved October 22, 2014. Levi-Faur, David. Economic Nationalism: From Friedrich List to Robert Reich. Review of International Studies, 23, 1997, pp. 359–370. Levi-Faur, David. Friedrich List and the Political Economy of the Nation-State. Review of International Political Economy, 4, 1997, pp. 154–78. Notz, William (June 1926). "Frederick List in America". The American Economic Review. American Economic Association. 16 (2): 249–265. JSTOR 1805356. Selwyn, B. (2009) An Historical Materialist Appraisal of Friedrich List and his Modern Day Followers', New Political Economy 14 (2), 157-180.